Wandering near the Museum of Docklands I have often looked at the replica of the Hibbert Gate and wondered what happened to the original . The original Hibbert Gate was built as the principal entrance at the west gateway in 1803. 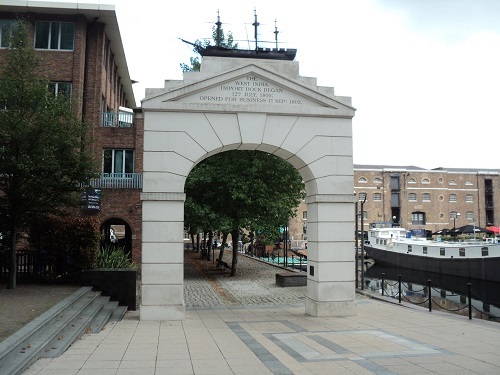 It was made of a Portland Stone arch surmounted by a pediment with a 10 feet long model of a West Indiaman ship called ‘ The Hibbert’ which was made of Coade Stone. 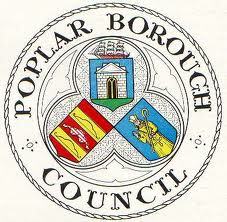 This striking entrance became the emblem of the West India Docks and later formed part of the coat of arms for Poplar Borough Council. However despite its historical significance, in the 1930s it was decided that the entrance was not wide enough for modern vehicles and was to be demolished. Although there seemed little opposition to the destruction of this historic entrance, a newspaper reporter at the time questions ‘the price of progess’. Construction and destruction go hand in hand with progress in London, as in every other great city. Symbols of modernity rise almost daily on the ruins of old landmarks, which, were it not for the feverish hand of man, would withstand the stress of time and weather indefinitely. 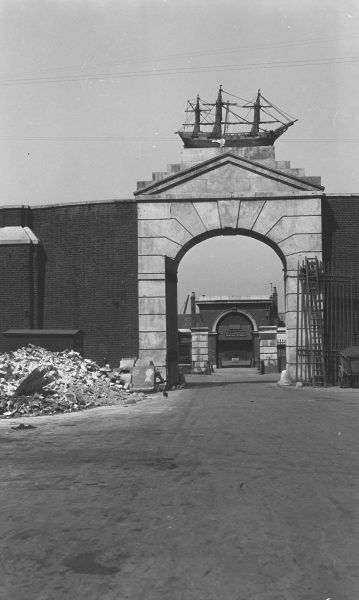 We are now told that the Clock Gate at the famous West India Docks, having outlived its usefulness and become a nuisance to traffic, must come down -is, in fact, already being demolished. Thus will disappear a landmark which, for 130 years, has served to turn the minds of Londoners back to that auspicious day when Pitt laid the foundation-stone of “the most magnificent dock in the world.” What the “most magnificent dock in tne world” mean’t in 1802 can be realised from the fact that the vessels to be accommodated in the West India Docks were put down at 300 tons each. The import dock, which is part of the West India Docks, could hold 204 ships of such size, but, judged by modern standards, it would be considered, of course, quite a puny affair. In this romantic dock there are several reminders of the age when men went down to the sea in sailing ships of the graceful clippers that rode the bounding wave. There is, for example, an ancient guardhouse, with two massive iron-cased pillars nearby to deflect the jib-booms of ships and prevent their damaging the adjacent warehouse or walls. There is too, a tall iron post surmounted by a bell which is still rung as a signal for fires and the extinguishing of all lamps and candles On the centre arch of the old gate way the eye was wont to behold a fine model in artificial stone of an East Indiaman named “The Hibbert.” Alderman Hibbert was principal director of the Docks Company, and, strangely enough, although his name had been forgotten in that association, It was preserved on the counter of this model, which measured about ten feet in length. In “The Peep show of the Port of London.” Mr. Linney says that “The Hibbert” underwent much overhaul, from time to time, and had a lead covering laid over her to preserve her from the destroying influences of the London climate. Her rig was somewhat queer, but the explanation was given that the dock master’s autocratic powers compelled a ship to submit to many things when once it had entered this “fortress dock.” Now, we hear, the model is to be given to the Poplar Borough Council, and will be re-erected in the Poplar recreation ground, where the modern generation will probably wonder what on earth it is. 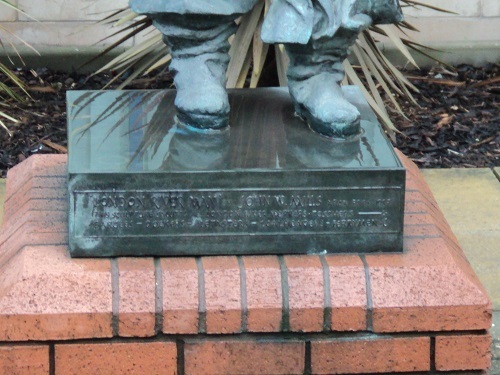 The model was placed in Poplar Recreation Ground , however a combination of vandalism by the ‘modern generation’ and bomb damage left the model in poor condition. A last effort to save it failed, when the model collapsed in pieces whilst an attempted removal to Poplar Library. 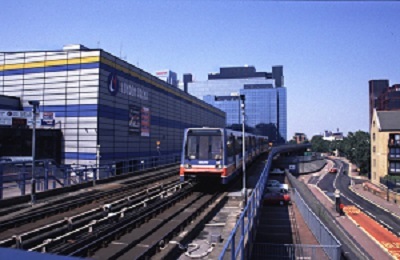 The London Arena which opened in 1989 was located in the Isle of Dogs near to the Crossharbour, in an earlier post I discussed its rise and fall. Whilst a number of top performers appeared there, I was surprised to find out that in 1990, the venue for four nights played host to Frank Sinatra on his 75th Birthday tour. Sinatra was no stranger to London appearing here many times, but usually in small theatres or the Royal Albert Hall. From some of the reviews of the concerts it seems that Ol’ Blue Eyes was still a class act but age was catching up with him. Actress Penelope Wilton attended one of the concerts and gave her impressions in a interview in the Telegraph. You couldn’t see him to begin with – you just saw this huddle of figures coming down a ramp, surrounded by flashbulbs. Suddenly, out on stage emerged this little man with grey hair. But when the orchestra started up (his son was conducting) and this wonderful voice came out, you realised that Frank Sinatra had arrived. Actually, by then his voice had gone a bit. He was absolutely fine doing the big numbers, but he found the quiet notes more difficult. That didn’t spoil it for me at all. He was a wonderful actor when he sang, and was still able to create an intimacy in this enormous place. When the lights went down, it was like he was the only person there. Incredible. When it finished, I felt absolutely ecstatic. The evening made me think that I must go to more live gigs, but with my job I can never book ahead. In the concerts, Sinatra performed many of his classic hits including The Lady Is a Tramp , Strangers in the Night, Mack the Knife, One for My Baby (and One More for the Road), My Way and New York, New York. It turned out that these concerts and the later Royal Albert Hall concert in 1992 would be the last time he would appear in concert in London. 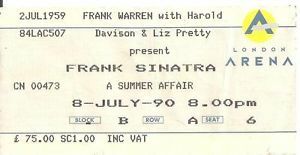 A number of people who attended the concert praised Sinatra’s performance but criticised the Arena, the price of the tickets (£75) and the transport difficulties they encountered after the concert. 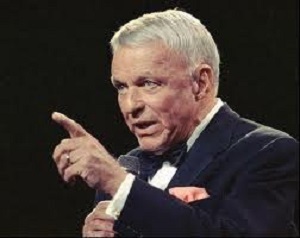 Sinatra died in 1998, the London Arena struggled on until 2005 when it was demolished. Some football fans may realise that Millwall Football Club began on the Isle of Dogs but less well-known is the fact that Arsenal Football Club played their first ever game on the Island. Arsenal was formed by workers at the Royal Arsenal in Woolwich in 1886, their first name was Dial Square, named after a workshop area in the Woolwich works. It was under this name that they travelled to the Isle of Dogs on the 11th December 1886 and played Eastern Wanderers who they beat 6-0. The following year 1887, the name of Dial Square was changed to Royal Arsenal and in the first game under the new name travelled to the Isle of Dogs again ,this time to play Millwall who beat them 4-0. 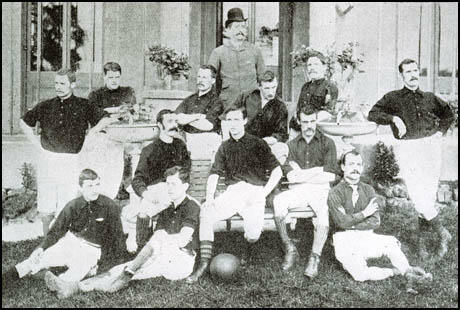 Although it has widely and officially been recognised that the 1886 game was Arsenal’s first game, in recent years questions have been asked about the game due to the lack of any newspaper reports of the game and the scarcity of any details about their opponents Eastern Wanderers. The only eyewitness report was from Elijah Watkins the Secretary of Dial Square many years later , it is safe to say he was not impressed with the pitch. Talk about a football pitch! This one eclipsed any I ever heard of or saw. I could not venture to say what shape it was, but it was bounded by backyards as to about two-thirds of the area, and the other portion was – I was going to say a ditch, but I think an open sewer would be more appropriate. We could not decide who won the game because when the ball was not in the back gardens, it was in the ditch; and that was full of the loveliest material that could possibly be. Well, our fellows did not bring it all away with them, but they looked as though they had been clearing out a mud-shoot when they had done playing. I know, because the attendant at the pub asked me what I was going to give him to clear the muck away. However recent evidence from an Arsenal History group has thrown more light on this game and provides documentary proof that the game actually took place. Using evidence from the Referee newspaper from 12 December 1886 , there is confirmation of the score and where the match was held namely Millwall. 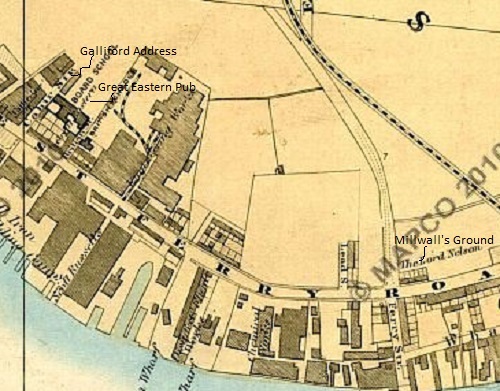 Other evidence to come to light was that Eastern Wanderers had two teams and their secretary was a D.W. Galliford who lived at 9 Marsh St , Cahir Street in Millwall. Millwall football team had been formed a year earlier in 1885, the club was originally based at the Islander Public House in Tooke Street and played their games on a pitch near Glengall Grove and Tiller St. However by 1886 the club decided to move to another pitch behind the Lord Nelson pub on East Ferry road, part of the attraction of the new pitch was they could start charging spectators who came to see the game. Therefore in 1886 we have at least two teams playing on the Isle of Dogs, Millwall and the Eastern Wanderers and two pitches. Both teams were in existence a year earlier when they played each other on the Glengall Grove pitch. We all know what happened to Millwall and Arsenal but little is known about Eastern Wanderers. Their secretary D. W. Galliford being based in Marsh St/Cahir St may offer a clue , for nearby was the Great Eastern pub (not the present day one) and considering that Millwall were based at pubs, there is a possibility that Eastern Wanderers were based there. It is also possible that they were a works team from one of the Engineering Works close by. It also seems likely that the match against Dial Square was probably played at the vacant Glengall Grove ground rather than Millwall’s new ground at the Lord Nelson. But from there the trail runs cold, until we find further evidence. we can only speculate that Eastern Wanderers was probably a short-lived works team, however a team that will be long remembered due to that fateful match in December on a cold muddy pitch in the middle of the Isle of Dogs. The Isle of Dogs is not often the subject of poetry, however recently I have come across the following poem by John Davidson. John Davidson was born at Barrhead in 1857 and after leaving school at 13, trained as a pupil teacher and then a teacher in Scotland. He had longstanding literary ambitions and decided in 1889 to go to London to find fame and fortune. He quickly joined other aspiring poets and writers such as W.B. Yeats and formed the Rhymers Club which met at the ‘Ye Olde Cheshire Cheese’ pub in Fleet Street. To make a living, Davidson wrote numerous articles, plays and books. However he barely made enough money to survive , although he often socialised with other writers such as Oscar Wilde and George Bernard Shaw. For all the support of his fellow writers, his work never caught on with the general public which meant his prolific output bought very little financial security. 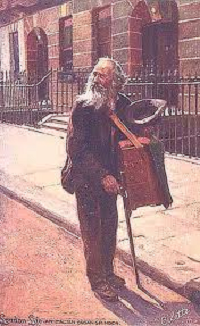 In 1906 he was awarded a civil list pension of £100 per annum , however the years of poverty, overwork and ill-health began to take its toll and late in 1908, Davidson left London to live in Penzance. On 23 March 1909, he disappeared from his house, some months later his body was found in the sea. From the letters he left behind it was clear that he intended to kill himself. 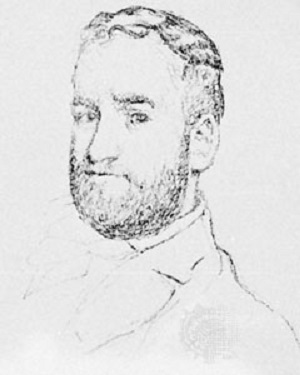 Davidson did not find fame in his lifetime, but is seen as an influential poet by later poets. T. S. Eliot was a great fan of Davidson and acknowledges his influence when writing The Waste Land, he especially admired the poems ‘Thirty Bob a Week’ and ‘In the Isle of Dogs’. Davidson was researching a book when he visited the Isle of Dogs in the 1890s, he was walking near the Millwall Docks when the sound of an organ in the street triggered memories of his homeland. In the Isle of Dogs by Millwall Dock. The ocean’s arm extended royally. Such meaning in the turning of a crank. For when the dark invaded day’s demesne. All hearts in common memories of song. Rang out in anguish and remorse. Alas ! That men must know both Heaven and Hell! Of peaceful graves and of the passing bell. A dirge For the departing undefeated day. The fittest utterance of the voice of earth. 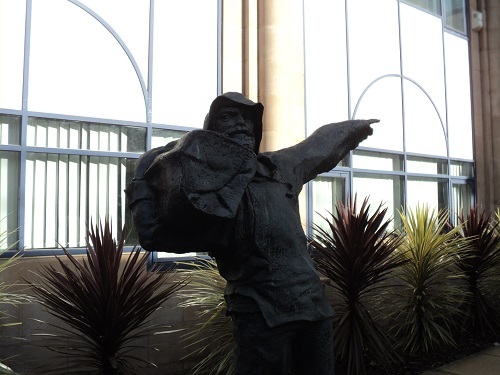 As regular readers will know, the Isle of Dogs is never short of surprises, however coming across the statue of The River Man on Marsh Wall was surprising due to the fact I have walked past the statue hundreds of times without realising it was there. In my defence its position in front of Ensign House near Admirals Way is obscured by buildings and the DLR. 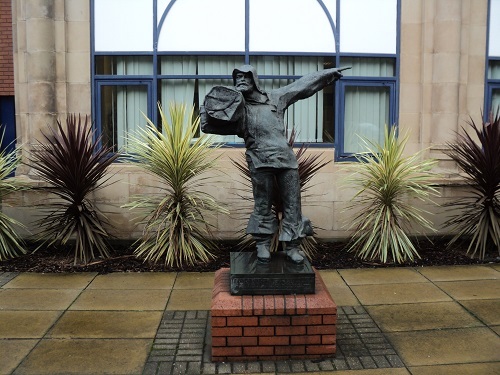 The statue was made by John W Mills in 1987, The statue is about 75% life size with the Figure being around 145cm high. 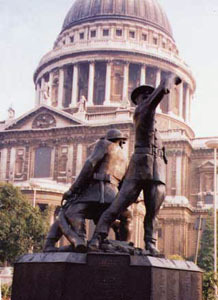 John Mills has a reputation as one of Britain’s leading sculptors with recent high-profile works such as the “Memorial to the Women of World War 2” which is now situated in Whitehall and the National Firefighters Memorial outside of St Pauls Cathedral. John Mills was born in London in 1933, he studied at Hammersmith School of Art and the Royal College of Art. In addition to his work as a sculptor, he worked as a teacher up to the 1980s. In the last 40 years he has had One Man Exhibitions all over the UK and around the world. His work is collected by the Royal Family and many prestigious galleries and Museums. 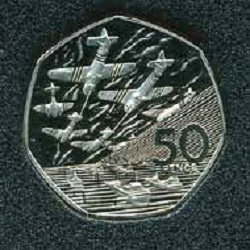 His work is probably known to most of us through his awarding winning designs for coins at the Royal Mint in the 1990s. There has been a ferry service between the southern tip of the Isle of Dogs and Greenwich since at least the 17th century, the early ferry was called Potter’s Ferry whose rights were coveted by Watermen who wished to control this lucrative route. Up to 1812 the Ferry was limited to foot passengers but then a horse ferry was established. One of the most ambitious ferry crossing was proposed in the 1880s when the Greenwich Ferry Company developed a ferry system that would enable large amounts of cargo to be transferred across the river. When we look at these schemes today, we marvel at the masterpieces of Victorian engineering, however not all the schemes undertaken were a success. The Greenwich Steam Ferry had a limited working career but was a remarkable piece of engineering but was sadly obsolete within a few years due to the building of the Blackwall, Rotherhithe and Greenwich Tunnels. The ingenious part of the ferry was the landing platforms which was raised and lowered according to the tide. This allowed the heavy trucks and carriages to have a smooth access to and from the boat. The Engineer magazine of 1888 gives a description of the opening ceremony. STEAM FERRY BETWEEN GREENWICH AND MILLWALL. On Monday, in the presence of a large company of distinguished ladies and gentlemen, the Countess de la Warre launched the first boat of the new Greenwich Ferry Company. The boat, which is called the Countess of Lathom, is a double twin screw of very powerful build, so constructed that she will ride at the landing stages of each bank between two piers, her side locking with the piers and open for carts and carriages. It is estimated that the ferry-boat will be able to hold as many as fourteen carts. The construction is different from that of the American boats, in as much that traffic does not enter end on, but at the side. By this method it is believed that more traffic will be admitted. Rails are also laid for the admission of railway trucks, and the traffic will be taken off the steamers at the level at all states of the tide. It is expected that. this ferry will prove a very great boon to the neighbourhood, and be largely patronised, for at present wheeled traffic, to reach the other side of the river, has to travel to London Bridge, a journey of about seventeen miles. By 1892 the same magazine reports that all was not well with the scheme. This ferry has already been in existence for some years, the steamers which are used in the service having been launched in 1888 from the yard of Messrs’ Steward and Latham, of Millwall. Special attention has, however, now been directed to the working of the cross-river communications, owing to a proposal which has been brought before the London County Council for the establishment of a ferry between Rotherhithe and Limehouse. It is estimated that such a scheme would entail the expenditure of about £400,000, and it therefore requires very careful consideration, or we would prefer to say rejection in favour of a bridge like that illustrated in THE ENGINEER of the 28th October last. The Greenwich ferry consists of a system of movable landing stages and of steamers, and the directors of the company are anxious that the County Council should take over the ferry as it stands. They candidly admit that with the half-hourly service at present in use, and with only one steamer employed, the ferry is not a remunerative business, but they plead that it is a service of great public utility, that it meets a widely felt want, and can now be acquired as a going concern at a moderate price. The Steam Ferry was never profitable. It was suspended between 1890 and 1892 and finally closed in 1899. The ferry was eventually killed off by the opening of the Blackwall Tunnel (1897) and the decision to build the Greenwich Foot Tunnel (started in 1899) and Rotherhithe Tunnel (1904-1908). Today all over the Country and indeed all over the World, people will remember the members of the armed forces who have died in the line of duty. 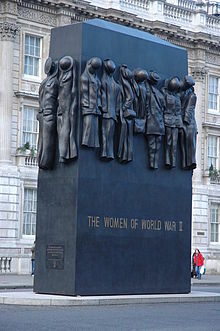 Thousands will pay homage at the high-profile events at the Cenotaph, however the Isle of Dogs is unusual for having very few War Monuments, many of the ones remembering the First World War were destroyed in the Blitz . 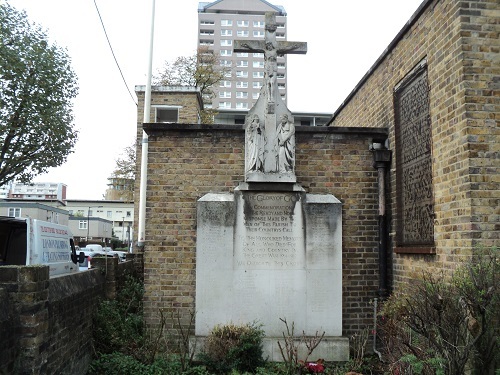 A rare survivor is the Cross and Monument standing in front of St Luke’s Church in Stafford Street in Millwall. 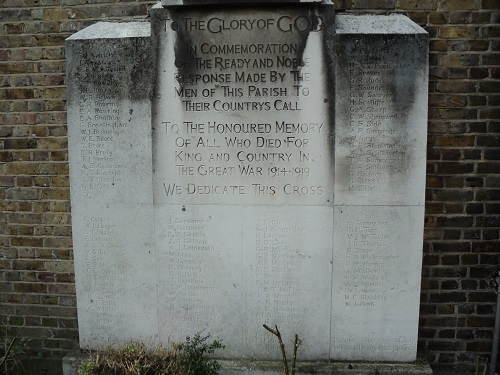 The Cross and the list of names to the fallen in the First World War has survived, however the rest of the original church it was attached to was badly damaged in the Second World War and was eventually demolished in 1960. 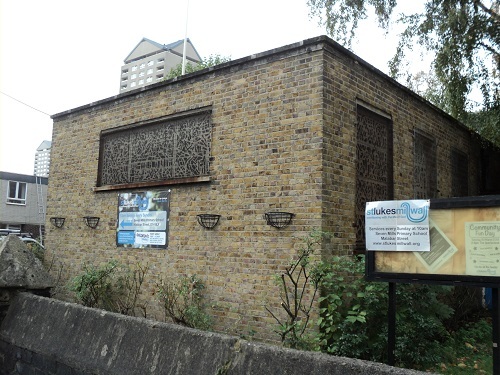 Since then the church has carried on with a make-shift chapel, tacked on to the church hall. 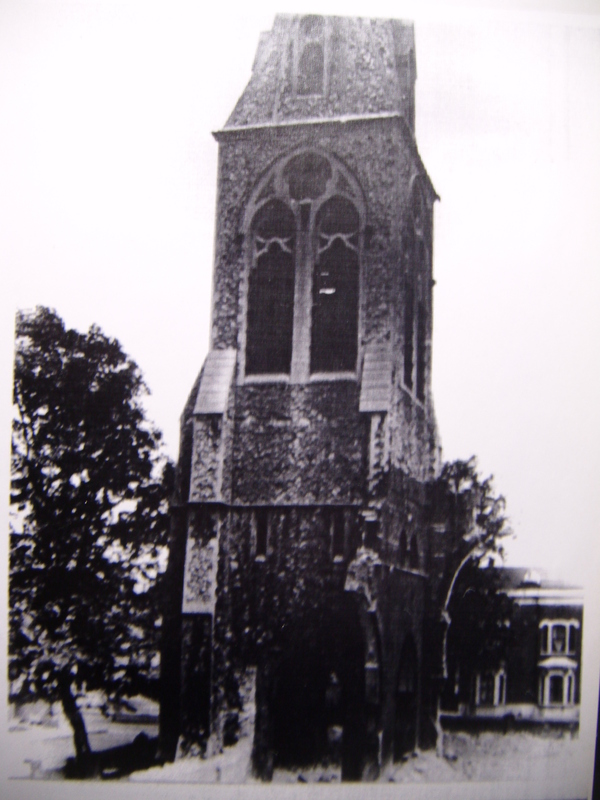 Although the appearance of the church is run down, it is a measure of how important the monument is to the church and local people that it was saved from being destroyed. 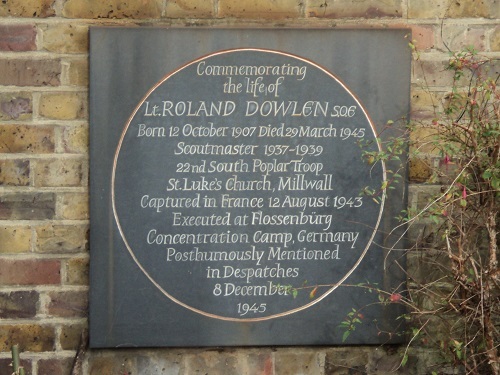 Next to the memorial is a plaque which remembers a Lt Roland Dowlen a former Scoutmaster at the Church whose death in a concentration camp in Germany is the tragic end to a remarkable story. Roland was born in Sicily in 1907 , his mother was American and his father Italian. He went to work for Royal Bank of Canada in Paris in 1923 before being transferred to the London branch of the Bank in 1933. 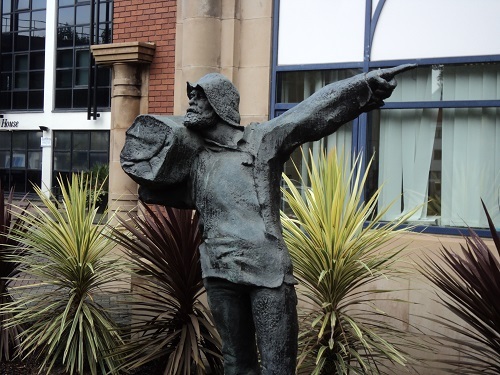 In 1936 he became a naturalised British subject, soon afterwards in 1937 he became first Scoutmaster of the 22nd South Poplar Scouts Troop based at St Luke’s Church. For the next two years he becomes a popular figure amongst the many scouts he trained. However it is the advent of the second world war that transformed the Bankworker/Scoutmaster into a Radio operator working for the top secret (SOE) Special Operations Executive. The SOE was officially formed in 1940, to conduct espionage, sabotage and reconnaissance in occupied Europe against the Axis powers, and to aid local resistance movements. It was a top-secret organisation based near Baker Street, people in the know nicknamed the organisation “the Baker Street Irregulars”, or “Churchill’s Secret Army”. Roland enlisted in the Army in 1941 and volunteered for the SOE, he had particular skills the SOE were looking for, namely speaking fluent French and experience of living in France for a long period. He was also methodical and calm under pressure. After training as a radio operator he was flown into France in 1943 to work with what was known as the Chestnut network. The three main SOE agents in the network were former racing car drivers who had contacts with many influential people in France. It was messages from these agents that Roland was to relay. This work was extremely dangerous and many radio operators were caught and killed quickly due to the fact that the Germans had their own Direction Finding teams who traced the source of the radio signals. Considering that the average life of a Radio operator in the field was six weeks, Roland exceeded expectations by surviving five months before being caught by the Gestapo in August 1943. Over the next 18 months he was moved around France and Germany, due to his role in the SOE he would have been mistreated and probably tortured to get information from him. Eventually he ended up in Flossenberg concentration camp where just two weeks before it was liberated by the Americans he was executed by hanging. His sacrifice was acknowledged by the British Army who gave him a mention in Despatches and by the French where his name is on Valencay Memorial. The Valençay SOE Memorial is a monument to the members of the Special Operations Executive F Section who lost their lives for the liberation of France. “This officer was landed in France by Lysander on the 18th March 1943 as W/T operator to a circuit in the Paris area. He worked for five months in this difficult region, and sent 39 messages to London. He was arrested by the Gestapo on the 12th August 1943, and spent over 18 months in captivity in France and Germany, during which time he suffered great hardships and severe treatment. He was executed on the 29th March 1945 in Flossenberg concentration camp. 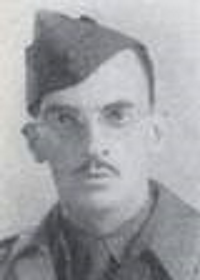 Remembrance Day is a reminder that ordinary people like Roland did extraordinary tasks but paid the ultimate sacrifice to defend their country. In the next few years the present St Luke’s Church will be transformed into a new church on the same site with the monument cleaned and relocated .